Stieglitz closed his 291 gallery in 1917. In the next two decades he made more photographs than he had at any other time in his life, and he also explored new subjects and ideas in his art. 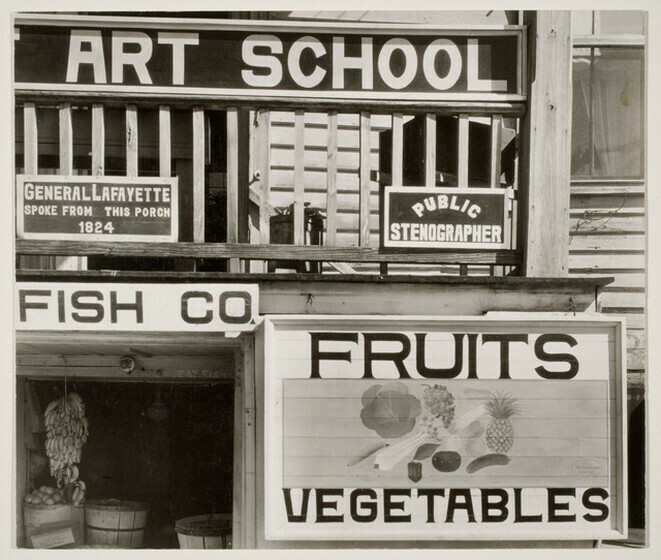 Inspired by the artist Georgia O’Keeffe, whom he married in 1924, he photographed the landscape around his summer home in Lake George, New York. In many of these pictures of clouds and the nearby hills he sought to capture, as he wrote, the “untouchable spirit” of light and earth. Later in the 1920s and 1930s, he made sharply focused, concisely composed pictures that celebrate the clarity of camera vision, as in the view out his window in New York City and the close-up of O’Keeffe’s hand displayed here. In keeping with the modernist belief that everything was in a constant state of change, he often explored these subjects serially, recording the same objects repeatedly over the years. For more than seventy years, Kertész made deceptively simple, yet poetic, photographs. He began to photograph in his native Budapest shortly before World War I, making intimate portraits of friends and family. In Paris, where he worked for a decade freelancing for illustrated magazines, and then in New York, where he moved permanently in 1936, he captured the rich spectacle of urban life in photographs that combine a seemingly artless spontaneity with a sophisticated understanding of composition. One of his most famous views of Paris is pictured above. After World War I, a parade of technological improvements transformed the practice of photography. With smaller cameras, faster shutter speeds, and more sensitive film emulsions, both amateurs and more serious practitioners could now easily record motion, investigate unexpected angles and points of view, and work in dim light and inclement weather. The amateur's less staid, more casual approach began to play an important role in the work of modernist photographers as they explored spontaneity and instantaneity, seeking to capture the cacophony and energy of modern life. Blurriness, distorted perspectives, and seemingly haphazard cropping-once considered typical amateur mistakes-were increasingly embraced as part of the modern, vibrant way of picturing the world. Brandt studied at the Bauhaus school of art, architecture, and design in Weimar before becoming an assistant professor there. Under the tutelage of László Moholy-Nagy she took up photography and began making photomontages, often using clippings from newspapers and film magazines to comment on current social and political events. This montage includes a reproduction of a famous photograph of actress Marlene Dietrich waving goodbye to Germany in 1930 as she set sail for America. 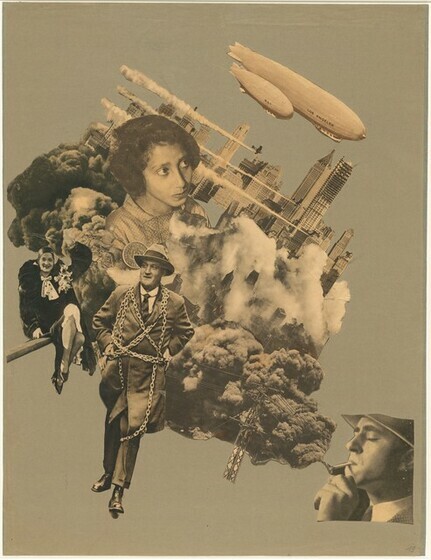 Ominous imagery ranging from a businessman in chains to smoke engulfing the lower half of the montage suggests the rising economic and political tensions of the time. Born in Germany and raised in Switzerland, Brandt moved to London in 1933, where he established himself as a photojournalist in the booming market of illustrated magazines. In 1938, he published a highly acclaimed book of seemingly candid photographs documenting London nightlife. In fact, he often posed family and friends to achieve his desired results. 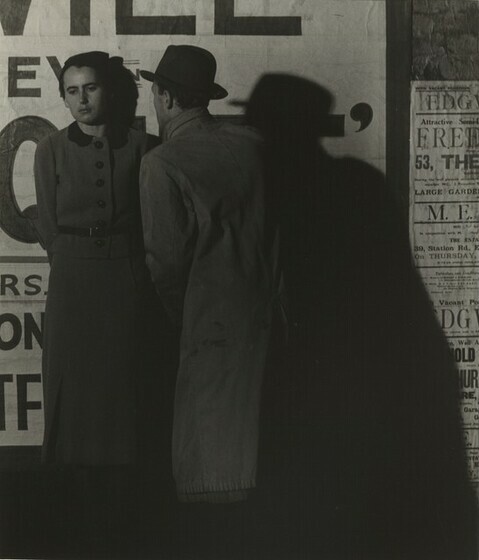 This photograph, for example, does not depict an encounter between strangers on a dark London street, but instead shows Brandt’s brother and sister-in-law. The dramatic lighting comes, most likely, not from the street lights but from large lamps set up by Brandt. Trained as a painter at the Academy of Fine Arts in Budapest, Kepes was an influential designer, educator, aesthetic theorist, and photographer. In 1930 he moved to Berlin, where he worked with László Moholy-Nagy, but eventually settled in Chicago and later Cambridge, Massachusetts. Created soon after his arrival in America, this startling photograph is both an intimate depiction of Kepes’s wife and a study of visual perception. Like the red leaf that seems to float above the image, the peacock feather — its eye carefully lined up with Juliet’s — obscures not only her vision but also the viewer’s ability to see her clearly. One of the most iconic photographs by the pioneering photojournalist Bourke-White, Fort Peck Dam, Montana was published on the cover of the inaugural issue of Life magazine on November 23, 1936. A striking representation of the machine age, the photograph depicts the stark, massive piers for an elevated highway over the spillway near the dam. The two men at the bottom of the print indicate the piers’ massive scale while revealing the vulnerable position of the worker in the modern industrial landscape. From 1929 to 1932, Man Ray made dozens of photographs of Lee Miller, his pupil, lover, muse, and collaborator who became an esteemed photographer in her own right. Man Ray, a prominent member of surrealist and Dada circles in Paris, met Miller during a period when photography was his primary artistic concern. Here Miller’s seemingly disembodied head, taken from an angle that emphasizes the captivating waves of her hair, typifies a surreal quality often found in Man Ray’s experimental photography. Best known for his unsentimental photographs of the American South made during the depths of the Great Depression, Evans exemplified the role of the photographer as an astute social observer. In pictures characterized by austere precision and clarity, such as the one displayed here, he explored the American vernacular—roadside cafes, signs, or barbershops, subjects that had been previously overlooked in photography.